Swim for mental stimulation and FUN! Massage can improve circulation, enhance flexibility, and catch small issues before they become big problems. It contributes to improved performance, increased strength, and overall well-being and fitness. And of course, bodywork feels great! It’s calming and relaxing, and relieves stress. Just like for humans, massage eases those aching muscles that can so easily happen after strenuous work – or play! Carolyn is a certified Canine Massage Practitioner – for additional information, please see our website for Backstretch Equine and Canine Massage. We are very proud to have Ruffwear gear available for sale. The flotation vests are a superior design with supportive buoyant panels that come right under the belly. We carry a limited stock, but can bring in anything you want in a short turnaround. 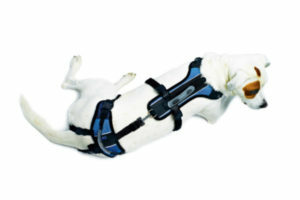 There are also harnesses, boots, collars, leashes, toys, and a myriad of cool gear for you and your dog. 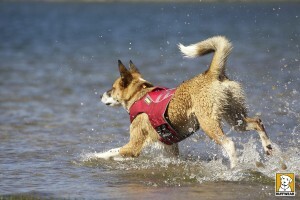 Click on the logo to check out the Ruffwear catalogue! We are not a veterinary facility, and cannot diagnose any issues. 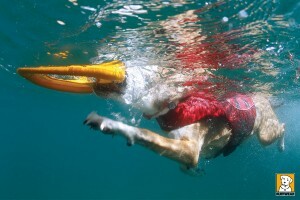 Participants require a completed Veterinary Remark Form prior to the first swim to determine that your dog has no contraindications to swimming, and to identify any precautions for swimming. All participants must complete a Client Information and Release Form. Please contact us for forms.